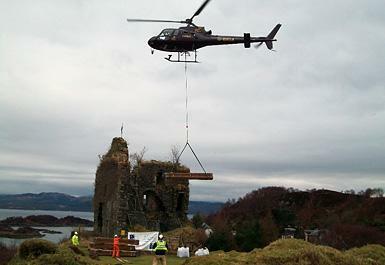 Tarbert Castle 3 year stabilisation and consolidation program. Tarbert and Skipness Community Trust have contracted LTM on a 3 year stabilisation and consolidation program to remove vegetation and secure the masonry structure of Tarbert Castle. The 13th century castle is of great archaeological significance and a good example of how the centralised royal power influenced the Gaelic Western seaboard at the time. This exciting project has been funded by the Rural Priorities scheme within the Scotland Rural Development Programme (SRDP). Due to the challenging logistics location of the castle over 30 tonnes of equipment and materials had to be airlifted on site by PDG Helicopters, whom commented “it was a pleasure working with you and your team, bringing back my faith that clients can be organised”.